Another Round of 500SP up for Grabs!! Who's ready for another chance to win 500SP of Delegation! We are! If money is not a constraint to you - But you can only choose One (1) place to go to; which holiday destination will you go to? Which city would you visit? Leave a comment below and tell us why! You can answer in the Comment section or link us in the comment to your New Post containing your answer. Tag at least 3 friends in your comment and get them to join the fun, the more the merrier! The contest is open for all Steemians!! We understand that a raffle may leave too much to chance, therefore this NOT a raffle! Winning factors include content quality, Post reaction by the community (organic payout and comment count in your post), Engagement (friends you've tagged who joined in) among others. Winner will be determined on the full discretion of @coingecko. This contest will last from March 7th to March 15th 2019. Great Submission(s) who may not win the contest will be further rewarded by us at our discretion. Should @coingecko break past 1000 follower count during this contest period, we will extend the winner count to 3! Go tag your friends to join the competition! We look forward to your awesome submissions!! CoinGecko.com aims to provide a fundamental analysis of the crypto market. In addition to tracking price, volume and market capitalization, CoinGecko tracks community growth, open-source code development, major events and on-chain metrics. If you feel that what we're doing is useful to you, please consider voting @coingecko as witness on Steem. You can read about our Witness campaign here. hello @coingecko here's my entry and I invited 4 people in my post. If I have a lot of money, l rather spend my life with my family. I had been away for 22 years working in a foreign land. If ever Steem will go to the moon. I will resign from my job,I will book for a round trip ticket flying from Philippines and have a multiple visit from one country to another. Then, I would stay beside my illing mother and my son with his family. And feed some people who are hungry. That would be the satisfying moment before I die. Thank you for the upvote and good words. I really meant it. Thanks @olivia08 for tagging me, hi @mers @mermaidvampire @tazky before I forgot to mention them. I'd just like to spend my holiday at Amanpulo Resort at Palawan, Philippines with my friends that cozy tropical paradise is a must have for my 2019. Thank you. How fast can you guys drum whip up a post? Goodevening @coingecko I would love to visit the states ! I would go to My fellow @HEYHAVEYAMET girl @ xcountytravelers , as uou look into her bio you See that she and her husband try to visit as many counties as possible and I would tag along! Underway we can plan Our onboarding steemit further and have fun. I you grand the delegation I would like it Yo go to @heyhaveyamet so we can do more with #steemterminal and the newcomers ! I would surely goto Bora Bora islands and just chill out and go diving ! Nothing beats the feeling of freedom underwater. Oh man! That's one of my list. Thanks for tagging and I'm gonna post my place too! Yippie! So I would like to tag @livinguktaiwan @deanliu @travelgirl to share with us where they would wanna visit if money is not a constraint. I would love to go to the South African Jungles. There is a serenity to it that cannot be compared to anything else. The game drives are just out of this world. Becoming one with nature, getting to see the wildlife and appreciating the majestic animals. Looking at the herd of playful elephants and pompous lions. It would be super awesome. I would love to go there and take it all in. It would be an experience that our future generations may not be able to witness. I would love to share it with them through pictures and videos, and the next generations would do the same to their younger generations. South Africa is absolutely majestic and the wildlife always reminds me that we are Human, and do not have to live like robots in a bustling concrete jungle. Can I mention I wanna go to the moon? Hahaha. Thanks @coingecko for another exciting contest! Since I can't go to the moon, what's next best thing besides moon? Of course the Northern Lights! Hence, I will go to Norway, Nappstinden City to enjoy the magnificent view. I get to enjoy watching the moon, the stars and the Northern Lights there! Plus it's the nearest I can go reaching the moon! What do you say Steem friends? I have the same dream. Haha. I would love to go to South Korea and explore every nook and cranny. I've watched so many korean variety shows and it seems like South Korea has a lot of beautiful places and delicious food, so I think it's only fair that i see and taste it myself 😂 and Jeju city is definitely in my list! Where would you guys like to go for a holiday? I would go to Hanoi Vietnam. I live in SE Asia now and money is a constraint. Whenever I have a visa trip to take I always look at this city and it is always the most expensive of my choices both in airfare and hotels. I feel like the old town area is an exotic refuge I would like to see. The French Architecture and street food are the biggest draws for me. Maybe some day I will get there! Tell us where you would like to go! I would like to go Venice with my family, because my wife love Venice and naked our lovely daughter Venice. Hey @coingecko I would like to go and relax while chilling myself in Maldives and go diving the clear blue oceans, and at the same time be pampered with the most luxurious hotels and have a SPA by the beach with the seabreeze blowing gently. Relaxing and thinking of nothing! Thanks @coingecko for this delegation. I would like to go Turkey because I would like to try their air balloon... That’s was really amazing in my life.. Certainly I would choose Paris. Is lovely day and night and have so manny cultural places to visit. I would like to go to Japan and have a taste of the salty sakura gelato if it exist because I only heard this tupe of gelato in one of my favourite anime. Thanks @coingecko for the awesome delegation contest. If it's possible, I would like to go Antarctic and having some mystery yet adventurous exploration mission. I would like to go Santorini ! My next dream destination as I love the blue blue white there ! I would go in Mathura. I think this is set contest. 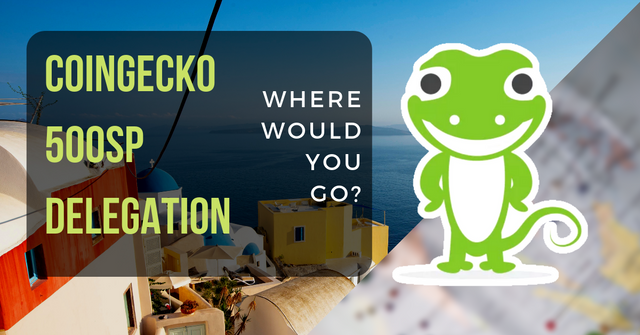 @coingecko, I will not say the name of particular place but i can say one thing and that is, any place which is covered with natural greenery with the combination of flowing water will be my place for sure. Stay blessed team and keep encouraging with these kind of contests. Nice delegation planning I like. I am ready to participate in this amazing contest and win this 500SP. Thank you for you sponsorship. Yes I will and am ready to join and invite peoples.